The lower mekong basin provides the ideal environment for fish to grow at an accelerated rate during the rain season. Cambodians celebrate the water festival (Bon Om Teuk) during the full moon of October or November, when the flow of Tonle Sap reverses its course to flow north into the great lake. This marks the beginning of the fishing season. The next three months are crucial as people must catch, preserve and store fish for the dry season. Fish is a major part of the Cambodian diet with an average consumption of about 2kg per person per month representing about 6,300 riels per person per month. However the catch fluctuates with the seasons. The catch of the Tonle Sap dai fishery in 2003/2004 was about half of that in 2002/2003, so the price of the most common fish, trey riel, rose more than threefold. 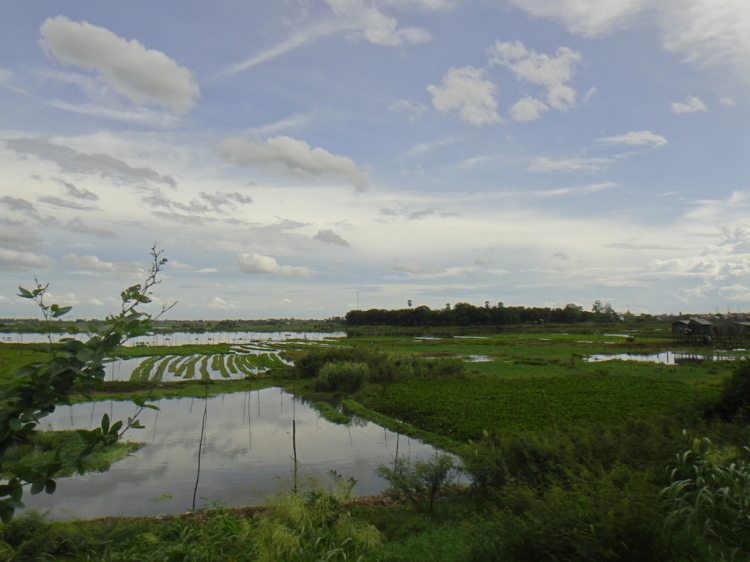 Rice fields occupy about 23,000 km2 in Cambodia, 83% of which is rained wet-season lowland rice, allowing settled agriculture because blue-green algae grow in the flooded paddies and fix atmospheric nitrogen, which then becomes available as nutrient for the rice: thus repeated cropping doesn’t rapidly depletes the soil of this primary nutrient. Fish and other aquatic animals contribute to the fertilization of the fields: they remain in small ponds in the dry season, spawn during the rainy season and fry or larvae colonize adjacent paddies. Brood stock were traditionally maintained by farmers (Heckman, 1979). Fish fry are also carried into rice fields when they are flooded by or connected to natural river systems. In rice field fisheries it has been estimated that up to 100 kilos of animal protein are produced per hectare and per year, amounting to about 40% of the value of the rice produced (Guttman, 1999). Systems for rice-fish culture have been developed and rained lowland and irrigated rice ecosystems offer potential for future improvements in yield (Gregory, 1997). However, increased use of fertilizers and pesticides is damaging the environment of rice fisheries. In addition, dykes and floodgates used to control water flows may isolate rice fields from natural waterways, preventing fish colonization and reducing the input of nutrient-rich silt. Fishery production depends on a healthy environment. Today the lower Mekong basin is subjected to a number of stress factors. Catches of the larger species have declined and, as more and more people fish each year with increasingly efficient gear, there are signs of over-fishing of even the smallest species. The rain fed rice fields offer a less favorable environment as it used to due to the combined impact of controlled waterways and usage of fertilizers and pesticides. As Cambodia develops, infrastructure buildup and population growth will impact traditional rice fish farming. Several programs are addressing these issues around the Tonle Sap by Cambodia’s Fisheries Administration (FiA) which intends to establish 1200 Community Fish Refuges (CFRs) in 75% of all communes by 2019 , . Women play an important role in inland fisheries and are involved, with other family members in local fishing, processing and marketing. Women dominate marketing of fish products throughout the country. Khay and Hortle (2004) found that 90% of sellers in fish markets in Phnom Penh’s 29 main fish markets are women. Small markets are the primary supplier of fish to cities or towns, providing significant employment opportunities for women in and environment where they can manage their own businesses. The lower Mekong basin has a great variety of fish of all sizes. The most common is the trey riel (cirrhinus lobatus, cirrhinus siamensis). Now this small fish represents about 50% of the catch in the Tonle Sap. The smallest fish of all is the rice fish (oryzias mekongensis) which is 2cm or less. There are two types of fish in Cambodian rivers and lakes: White fish need clearer water and although they migrate inland to the flooded plains during the rain season, they swim back with the current to the large rivers at the beginning of the dry season. Black fish on the other hand, can sustain drought an stay on the floodplain. They can tolerate the acidic waters due to the vegetation decomposition. Fish species from abroad have been introduced in Cambodian aquaculture such as the Tilapia (oreochromis niloticus). Fish fry is produced by 13 government hatcheries which sell in bulk to middlemen for use in aquaculture. Carnivore snakeheads which have a high commercial value must be fed with live fry and it takes 5 kgs of fry to produce 1 kg of fish product. Other fish fed on dried pellets are more affordable to raise since dried fish is commonly available in Cambodia at a very moderate price. Rice is not the only crop which can be combined with fish farming. The ancient Khmer traditions of growing vegetables along with fish is still in use today and Community First went to two villages in the suburbs of Phnom Penh to find out. We went to Tompung Boeung where vegetables are grown on floating beds in small lakes which also contain fish ponds delimited by fishing nets. The plants clean the water for the fish which in turn provide the nutrients to the plants, both benefiting from each other. The vegetables and the fish produced are sold to the local markets in Phnom Penh. The picture shows the production of basil in another village called Thnaot Chrum. Vegetable grown in the floating beds we visited were morning glory, water lilies and basil. The village chief told Community First about the floating beds, saying that he and his parents before him had always practiced this culture. He remembered his grandmother telling the kids the legend of old ancestor Ta Pon which used to come to the market with his carrying stick loaded with fish and vegetables from his small pond and garden (Ta Pon means “old carrier” in Khmer). The villagers were surprised to always see him bringing such bounty to the market, while they had to walk long distances and work hard to produce as much. They decided to learn from him and this is how the floating gardens were created. 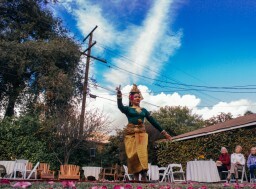 It is likely that the floating gardens have been at the center of the Angkorian economy, providing a balanced diet of vegetable and fish to the large population of the Khmer empire. Unfortunately, the floating gardens around Phnom Penh are under threat as the city is growing fast. When we visited Tompung Boeung, it was already surrounded by bulldozers and trucks and may disappear within a year or so to make way to a new residential area. The technique described above is known as aquaponics, where fish and plants are grown in the same symbiotic environment: fish eat food and produce waste (mainly ammonia), which is degraded into nitrates by naturally growing bacteria, which are pumped out of the fish tank into the grow bed plants. The control of this “nitrogen cycle” is made possible by new technologies, now widely available and affordable. Nowadays aquaponics systems can be very compact and are suitable for a single family. A basic aquaponics system consists of a fish tank, a grow bed with plants, and a water pump. 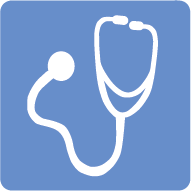 Air pumps and bio/mechanical filtration components as well as sensors and controls ensure the correct balance of water in the system. Community First is working with professor Sam Landsberger and his team from CSU Los Angeles to develop a pilot suitable for use in developing countries. 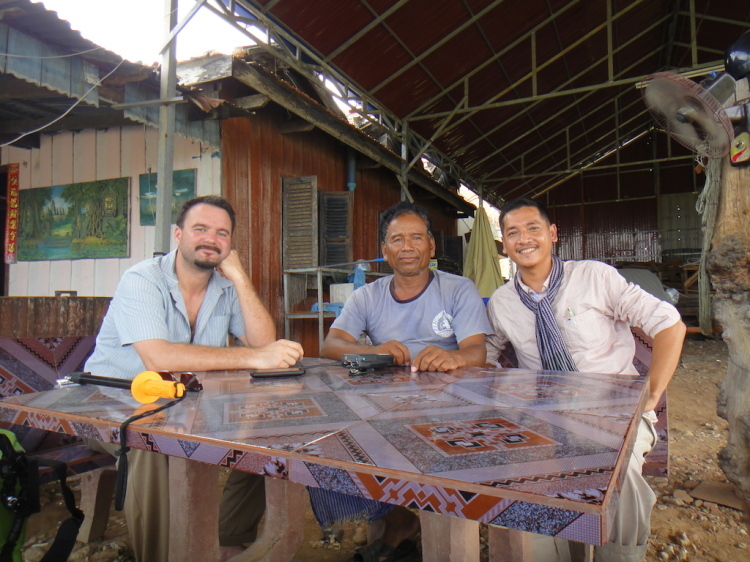 Community First has identified aquaponics as one of their lead initiatives to sustainable rural development in Cambodia and elsewhere in the world. 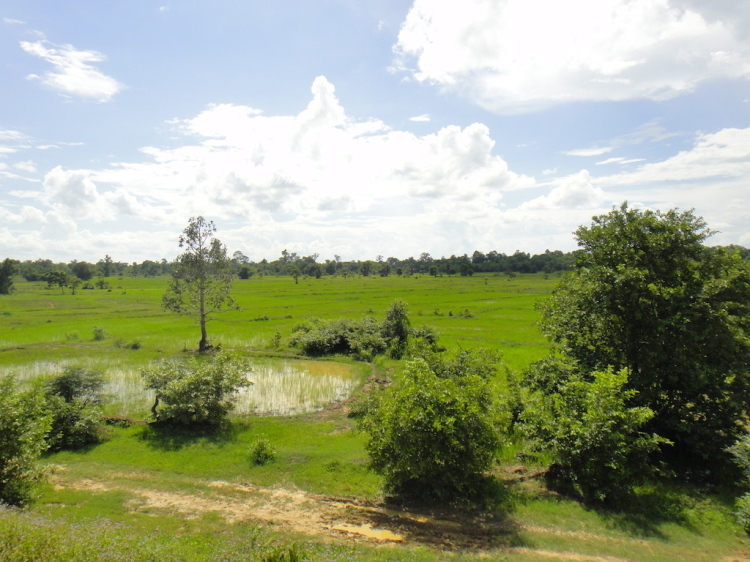 Two projects will be completed in Cambodia in 2014: in the Siem Reap Lotus Farm and in Bakong in collaboration with the Apsara Authority. If you find this article and our cause interesting, please help us spread the word and further our mission by sharing it with the links below! For more information on Samatoa, check out their website or like them on Facebook. 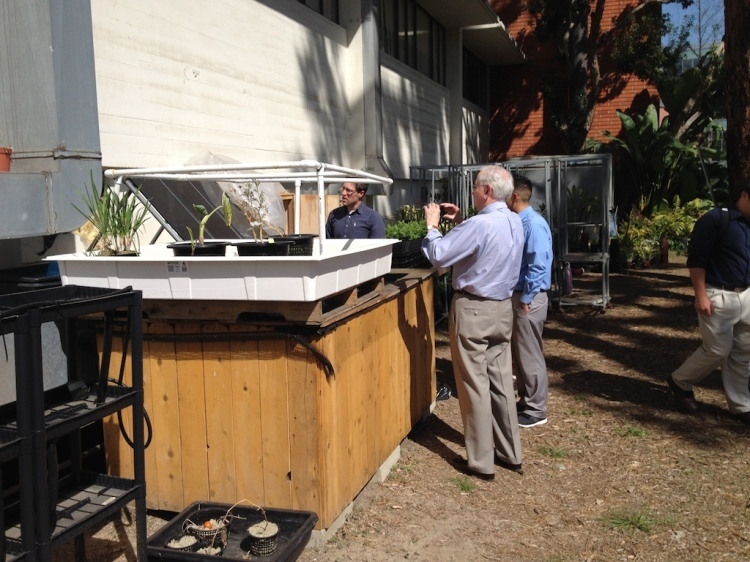 The month of August 2014 marks the beginning of our Aquaponics builds. We have three builds coming up in Siem Reap, one at Samatoa, one at the APSARA Authority, and the final one will be a chinampa style build at Golden Silk. 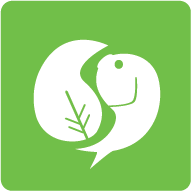 If you have any knowledge of the use of lotus in an aquaponics set-up, chinampa-style aquaponics, or are simply interested in tracking our progress and results, sign up for The Exchange, our nonprofit social networking platform, and share your insight or comments! I’m actually trying to get something very similar happening here in Kampot, Cambodia, basically for my own survival and that of my Khmer wife, kids and family.